"I am fond of being acquainted with the signs and symbols specific to our village's ancestors [which are still relevant to me now]. Traditions such as oral practices, chanting, ancient myths and stories, added to the collective life at the village constitute the centre of my craft. They represent the fueling elements of my creativity. They are permanently channeling some energy to me along the creative processes." Temandrota's wood sculptures are informed by the ancient myths and folktales from his childhood, as well as the rites of passage that punctuated rural life. Circumcision rituals, turning the dead celebrations and wedding ceremonies are customs represented by intricate pattern making and geometric forms by the artist. His use of plant barks and wood fibres, along with other natural materials (even the dung of zebu, an indigenous cattle) reflect the strength of nomadic traditions in his practice. More recently, Temandrota has begun to explore the mediums of performance, installation and video. His work also incorporates the noises and sounds often heard in the tropical forests of Madagascar. 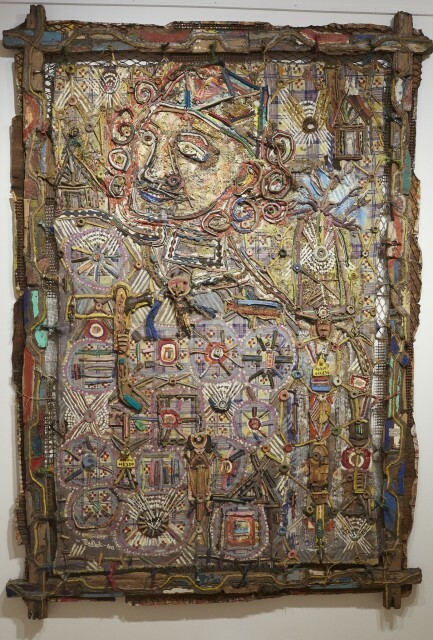 Acknowledged as one of Madagascar's most successful contemporary artists, Temandrota has exhibited in numerous countries including Haiti, Germany, Belgium, Canada, La Réunion and South Africa.